1. Print out the patterns to the size you need and transfer the markings on to the wood. Saw out for each pumpkin an additional “slice” piece. This will give the pumpkins a 3-D look. 2. Cut a base out in a roundish form and cut 2 tulip shaped pieces out. These will be the grass pieces. 3. Saw all of the pieces out and sandpaper the pieces smooth. 4. Paint all of the pieces accordingly. 5. Drybrush shading and highlights on all of the pieces. 6. Drill the holes in the base of the pumpkins and the grass pieces. 7. Drill a hole in the crow’s body and a hole in the crow feet. Insert the skewer in the holes forming legs. Use wood glue to secure these in place. 8. 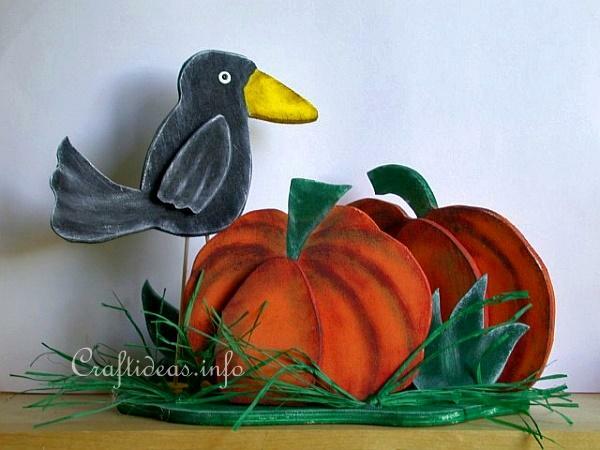 Glue the slices onto the pumpkins. Screw the pumpkins and grass pieces now onto the base. 9. 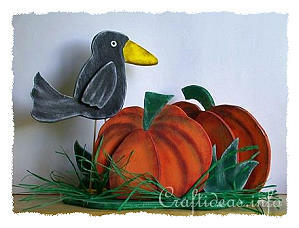 Glue the crow’s feet onto the base.